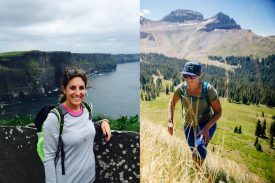 (OGDEN, Utah April 2, 2019) — Salomon welcomes two new hires to its brand marketing leadership team in the United States, Becky Marcelliano and Erin Cooper, bolstering its commitment to the run and outdoor categories. Cooper, formerly of Saucony, joins as run marketing manager while Marcelliano, formerly of Deuter USA, will serve as outdoor marketing manager. Both will execute within North America on global brand initiatives and go-to-market strategy for footwear, apparel and gear across their respective categories. “Becky and Erin bring years of leadership experience to Salomon and we are thrilled to expand the brand marketing team with expertise dedicated to the hike and run consumers. These new hires will work closely with our global, commercial and sales teams to deliver relevant, engaging tool kits for the North America go-to-market teams,” says Jenny Taylor, brand director for Salomon in North America. Erin Cooper joins Salomon after nearly eight years at Saucony, where she most recently served as account marketing manager, overseeing the brand’s wholesale partner marketing plans, point-of-sale programs and brand activations. She got her start in the industry as a retail sales associate in the specialty run channel and is an avid runner in her personal life. In her new role as run marketing manager in North America, Cooper will drive key brand marketing initiatives across footwear, apparel and gear in both the road and trail running categories for Salomon. “Salomon has already been a leader in the trail-running category with the Sense, Cross, and Ultra collections, and now has a lot of momentum with the introduction of the Running Avenue road product. I’m thrilled to join a brand that not only aligns with my passion for running and getting outside, but also has so much energy going into the year,” says Cooper. Prior to her new role as outdoor marketing manager at Salomon, Becky Marcelliano managed marketing strategy and execution across Deuter and Ortovox in the U.S. Additionally, Marcelliano has invested significant time in art and wilderness education, diversifying the perspective and expertise she brings to her roles in the outdoor industry. Moving forward, Marcelliano will manage all aspects of marketing for footwear, apparel and gear across Salomon’s hiking, backpacking, watersports, lifestyle, winter, and kids’ categories in North America. Cooper and Marcelliano joined the team on April 1, 2019 and will be based in Salomon’s U.S. headquarters in Ogden, Utah. For more information, please contact Account Manager Emily Banks at emily.banks@rygr.us.